Our flagship mobile stage trailer. Delivered to an event and fully operational in less than 2 hours . 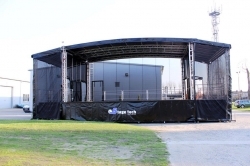 Stage area of between 60 and 84 sq m .
Technical areas available for both sides of the stage. Lighting can be installed at low level before the roof is lifted into position. Stage performing height of 1.5 m.
Available with either scrim or solid sides and back. Two stair cases are supplied with this stage. Ramp can be supplied for ease of access onto the stage. 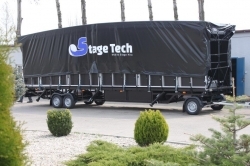 Full specification of this stage is in our technical section.